And it will always be a terrifying day. A day of forgetting the things that don't really matter. I wish it didn't take something like this to wake us up and draw us together! perfect .. hugs .. it eerily like that morning 11 years ago .. same almost cloudless skies, same cool temps .. I do so agree with Barbara! We all need to focus on the things that do matter and not just for this one day. Hopefully,then we won't need to be awakened by this kind of horror ever again. My friend has a ten-year-old kid that doesn't know what 9/11 is. Education is lacking in this country. People will forget. That's just the truth of it. They'll belong with the crowd that denies the Holocaust ever happened in another fifty years. Oh and that evolution isn't real. That was a sad day for all of us. Thank you so much for this post. thank you so much for this post, reena. This generation will never forget. And I hope future generations won't either. 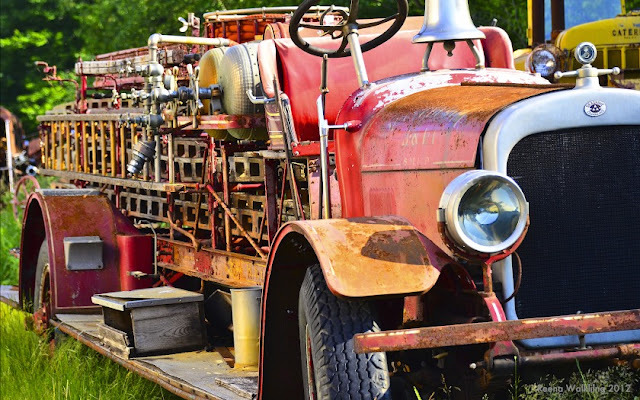 Nice image of the old firetruck. A real find Reena ... something sad but heroic about this pic. A great tribute to the day the world changed for us. Don't think any of us will ever forget. What a terrible day in our nations history...changed the course of everything including being critical of everyone and everything going on around us. Those innocent days are over and I'm not sure it will ever be the same again as it was before. Beautiful! When we visited the site in April, I was so amazed at the relatively small "footprint" of such devasation, horror, and loss. No can't forget, I like this tribute. Reena, lovely tribute and words. I will never forget. Have a great day, Eileen! Such a sad day. I will never forget when I heard the news. I was driving my daughter to school and I heard it on the radio. I almost pulled over. I really couldn't believe what I was hearing. A day I will never forget. Nice fire engine, and great tribute. You are absolutely correct. Never forget. Thanks - I didn't post anything thing this year but did last year. As I told Barbara (above commenter) on her blog post - I didn't forget and never will forget. The memory is in my mind and heart forever.